Norm Architects has built a cluster of minimalist "houses" in a former warehouse on Copenhagen's Paper Island to create a showroom for Danish design brand &tradition. The Village on Paper Island provides a showroom and offices for &tradition and was designed by Copenhagen-based Norm Architects, who have been creating trade fair stands, pop-up shops and installations for the brand for five years. "This is a unique opportunity to be able to display the entire collection in one space and to show how our products work together in different settings," said &tradition brand director Martin Kornbek Hansen. 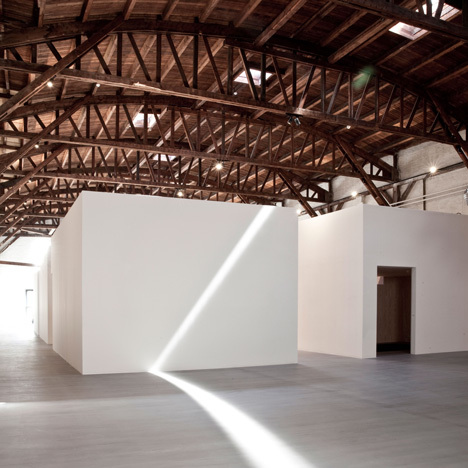 Originally used to store paper, the building was stripped back to expose the wooden roof beams and trusses while concrete and resin cover the floor to create a smooth matte finish. Twelve white "houses" are positioned in the centre of the building to form a cluster reminiscent of a Mediterranean village, with streets and alleys between each block. An open square in the middle is used like a public piazza, where large groups can meet for talks, presentations and parties. "We have been working intensely with archetypical elements from village architecture, like the city square, the church tower, the main streets, the alleys, the perfect grid and the imperfect irregularities that occur by chance," said Linda Korndal of Norm Architects. The houses are all slightly different sizes and are used for various functions: from display spaces and workshops to meeting rooms and kitchen facilities. Some have large windows and doors, others are monolithic, while a few feature internal staircases and even a roof terrace. They all sit well below the height of the roof of the original building, which spans over the houses to the back of the warehouse where an open-plan office space is situated. "It's like an alphabet of building types," said Norm Architects' Jonas Bjerre-Poulsen. "They're all part of the same family but with different characters and functions." The houses are designed as white cubes to display &tradition's furniture and home accessories. 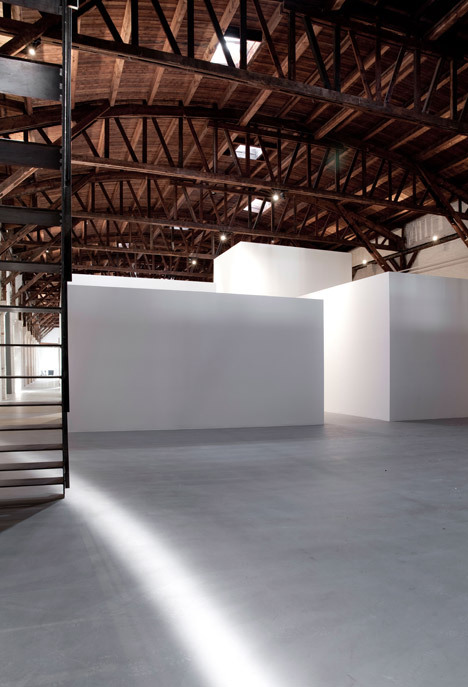 "What we're really excited about is that every six months we are planning to invite artists and designers to create an overall concept for the space, so it will function like a gallery for our products," said Kornbek Hansen. The warehouse is located on Paper Island – also known as Christiansholm – in Copenhagen's harbour, an area fast transforming from an industrial landscape into studios and workspaces for creative individuals and companies. Photography is by Jonas Bjerre-Poulsen, Norm Architects.